I have always wanted to be the kind of person who makes their bed each day. Unfortunately, I am not a morning person. I’m not even a particularly clean person! So that goal has always felt slightly unattainable. Get up a few minutes earlier to tuck in my sheets and carefully fold my comforter to look nice? I’d rather hit snooze again. But this started to change when I got this Crane and Canopy duvet cover, because, wow, it makes it so much easier to have a nice-looking bed. 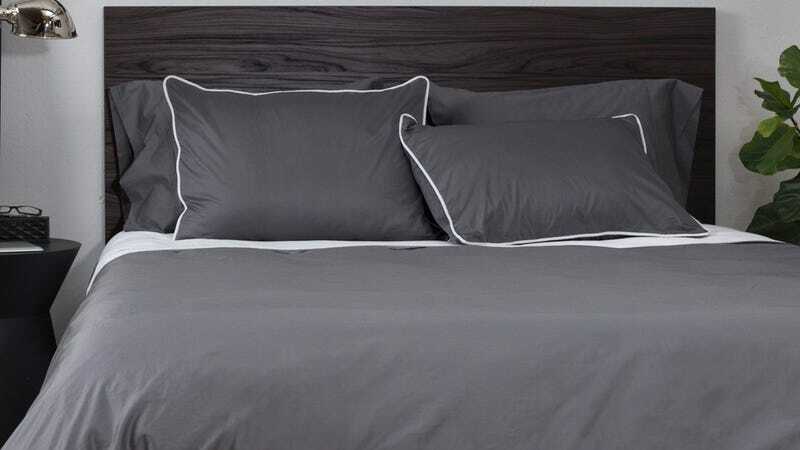 The Crane and Canopy Nova Duvet Cover features a pretty innovative design for a duvet cover, and was literally designed for people who want the clean look of a made-up bed without having to do any actual work to get it. When you properly make a bed, you’re supposed to pull the top sheet up to the head of the bed, then neatly fold it back over the top edge of the duvet, blanket, or comforter. Carefully folding that way obviously takes up more time than simply pulling the comforter up to the head of the bed. The Nova Duvet Cover, though, allows you to remove that step from your bed-making process. It’s a two-tone cover that gives you the look of that folded-over top sheet, without actually folding over your top sheet. The delicate accent strip along the cover makes this look even more realistic. Basically, all you have to do to make your bed look perfectly made is to pull the comforter up, and smooth it out. It’s simple and fast, and truly looks Pinterest-worthy. What I really love about this is that I don’t actually sleep with a top sheet, so in the past, I’ve never been able to get that folded look that I wanted. This duvet cover makes it look like I have one, and it literally takes me less than five minutes to make my bed look awesome after I wake up-and even I can handle that. The other great feature about the Nova cover is the zip-enclosure. I’ve been using down comforters for years now, and my only complaint about them is that they are so difficult to get into a duvet cover. I’ve had duvet covers with small openings that make it hard to maneuver the comforter in and out, and ones that make it hard to fix the placement if necessary. The Nova cover has a zipper in the middle of the bedding (which is conveniently hidden so you never see it) that makes it so much easier to get the comforter in and out. The zip enclosure opens wide enough to make things fit easily, and if you ever need to adjust the comforter, you can just unzip and do so. It’s hard to put into words how much more convenient it really is. Aside from all of that, the cover is durable, comfortable, and feels great. It comes in a variety of colors and patterns, so you’re bound to find something that you like, it looks very chic, and it smooths easily. Crane and Canopy also offers matching shams that are equally as nice looking and easy to use: they have hidden zipper placements so they never fall off the pillow, and the white piping along the edges is a nice touch. At the end of the day, I can tell you with confidence that I will not be purchasing a new duvet cover any time in the near future-unless it’s a second color of this exact same one.